Dashain is the biggest festival in Nepal. It holds a special place in our hearts. I once quit a job just to be home for Dashain. So, you can guess that Dashain is a big deal in Nepal. This festival holds a special significance. It signifies unity, defeat of good over evil, respect towards our elders, lots of food, new clothes, a big family event and long holidays. 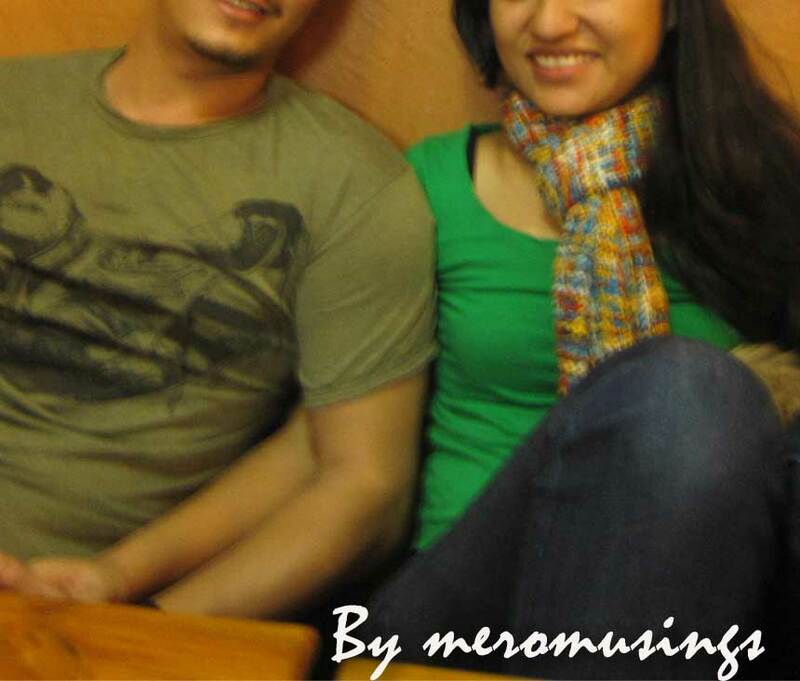 When I was in school, we had a full months holiday during Dashain, ahhhh those blissful days. Dashain is a 15 day event and Ghatasthapana marks the beginning of Dashain or start of Navaratri. After 7 days of Ghatasthapana starts an array of a week long festivities with each day holding some religious significance. The first sign that Dashain is around the corner is the weather. In Kathmandu, the weather is just perfect during Dashain, it is the end of summer and its cool and pleasant. All us of can relate to the special bright sunshine and how the sun is warm with cool breeze during Dashain, this kind of sunshine is called “pareelo gham” in Nepali. But staying far away from home, the clues of Dashain are status updates in Facebook and fellow bloggers writing about the festival, which is not bad either :). When my grandfather and grandmother still lived in the village, we all would go to the village to get blessings from them on the final day of Dashain, which is called Tika. There are a lot of things about Dashain and I can go on and on talking about my fondness for it. But today I will focus on how my childhood Dashain used to be, when we went back to the place Bua(dad) was born and when I was about 6 or 7 years old. The place my Bua was born is Bhorle, Dhading. It is not so far from the capital city but it didn’t mean it was easy to get there. Going to Bhorle used to be an adventurous trip for us. I think Mom and Bua had discussions whether or not we should go to Bhorle this year. To go to Bhorle, we had to take a bus from Kathmandu and get down at Adamghat, which took around 3-4 hours during those days. After getting down at Adamghat was a steep trek of about 8-9 hours!! My dad was born somewhere in the remote hills of Dhading district and until few years back there was no means of transportation that would take us there. The only option was either to walk or be carried on a Nepali basket made of bamboo called “Doko”. So Mom and Bua had a hard time deciding whether or not to take the kids to Bhorle for Dashain(which of course I found out later from mom). I have faint memories of my Bhorle trek. 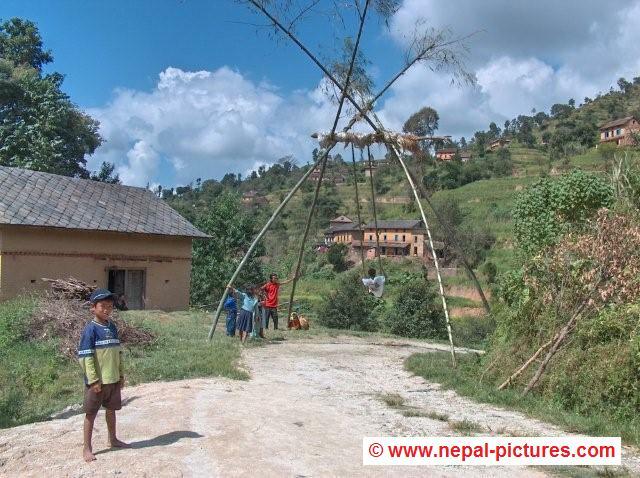 We have the pictures at home, which reminds me of Dashain in Bhorle. My Mom looks extremely pretty in her red sari and red pote(necklace for married women in Nepal). Trip to Bhorle used to be a lot of fun for us kids. Me, my brother, my uncles and cousins had our little gang. Our uncles were the guide and leaders as they had travelled the trail quite often and were experienced. So me and my brother had a lot of fun as city kids going to the village. We used to be amazed by the nature, the insects we saw on the way and the cows, buffaloes, goats, hens we saw in the village and if we were lucky we could sight deers and how our uncles always warned us of Jackals or “Bwasoo”. We also got to enjoy the wild berries and wild fruits on the way to Bhorle. Everyone would take special care of us since we were small kids and from the city :). I can recall that everywhere we rested, we were offered with “Mahi”(homemade yoghurt smoothy?) and “bhuteko makai”(roasted corn kernels). And we had someone my Bua or Hajurbuwa(grandfather) knew on the way top and they would make remarks like, “Ohh so you are the son of so and so and the grandson of so and so”. And when we would be too tired after few hours of walk, there would be potters and sometimes our relatives or uncles who would carry us in Doko. The way to Bhorle used to be beautiful with green trees, far away view of himalayas, open grasslands and the endless hills. I wonder how it is now. And since it was Dashain, there were Bamboo swings at every small village we passed and it was a lot of fun to play in those swings. But we could never match up with the village kids who played wild and looked like they had far more fun than us. Photo Credit-http://www.nepal-pictures.com: A swing similar to the numerous swings or “Ping” that we encountered on our way to Bhorle. So Bua always made remarks to us saying how we were the broiler chicken and the village kids were the local chicken. After crossing every hill, we used to ask our uncles how much farther it is and they used to show us a nearest hill and say behind that big hill is our home or “Tyo dada ko pachadi hamro ghar cha” but once we crossed that hill they used to again point us to another nearest hill and say the same thing!! I do not precisely remember other details from the trip and how we finally reached home. The next thing I remember is the tika day or the day when the elders in the family put tika on foreheads of youngers as a blessing. For the boys it was all about goat meat; which part of goat they wanted to eat and flying kites. For girls it was about the money they were going to earn after tika which is called dakshina and new clothes they were going to wear on tika day. I think during those days we got 25 paisa, 50 paisa as dakshina. I have a colourful picture that we took at Bhorle after tika which is in Kathmandu and too bad I cannot post it right now. So this was Dashain all about when I was a little kid, one of my first memories of Dashain. Today Dashain is still about going back home, being together with mom and Bua and receiving tika from them. It makes me a little sad that I cannot be home for Dashain this year too. So, my wish for Dashain this year is may my Mom and Bua have a wonderful health, may goddess Durga bless my home and make it harmonious, may Mom and Bua be happy and healthy all year around and may I be able to serve my parents in every possible way. Happy Dashain Mommy and Bua. I am sad that I cannot be home to share Bua’s enthusiasm of goat meat and Mom’s excitement of navaratri puja. But I will definitely Skype and receive blessings over the internet!! And Happy Dashain in advance to my readers as well! P.S: Ghatasthapa falls on 16th October this year and Tika falls on 24th October.